Lindsay Puscas has participated in all of the different areas and disciplines of riding because she wants to be a well rounded instructor and trainer. Her love of horses and children has inspired her to open Encore Equestrian Center in the hopes of building a fun, relaxed atmosphere for children and adults to come and learn about horses and the sport of horseback riding. This barn is a relaxed, family-oriented atmosphere. Our main objective is to have fun!! Lindsay Puscas has been riding horses for the past 18 years. She has competed in Hunt Seat, Jumping, Dressage, Western, Saddle Seat, and eventing. Lindsay was a member of the Eastern Michigan University Equestrian team. She graduated with a bachelor's degree in Elementary Education. In May of 2003 Lindsay completed a natural horsemanship training apprenticeship in Virginia with Kenny Harlow, a John Lyon's certified trainer. She has also attended clinics put on by Clinton Anderson, Pat Parelli, Dave Ellis, and Gawani Pony Boy. This is Debbie and Amy Kloster helping with the evening feeding. At the current time there are no other "employees" at Encore Equestrian Center. We like to encourage students and their parents to help around the barn with all sorts of different chores. In return, we work out situations where people can work off lessons or leasing fees! 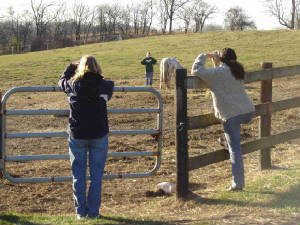 At the same time as saving themselves some money, they also learn about the real responsibilities of caring for horses.